Heart medication specifically for dogs may seem unusual, but it is far from uncommon. If your dog suffers from a heart condition, your veterinarian may have prescribed pimobendan. Pimobendan is a PDE3 (phosphodiesterase III) inhibitor, which increases cardiac contractility while dilating arterioles. In the simplest terms, it helps to relax blood vessels, thus lowering blood pressure and helping the heart to pump blood properly. 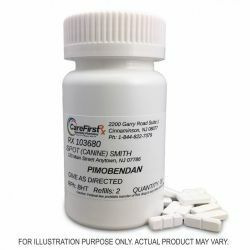 How can pimobendan help my dog? Pimobendan is a medication that is prescribed for a very specific heart problem: congestive heart failure (CHF) secondary to myxomatous mitral valve disease (MMVD). Pimobendan is not currently recommended for dogs with dilated cardiomyopathy (DCM) or hypertropic cardiomyopathy (HCM). Overall, dogs that take pimobendan tend to have a longer survival time and feel better than dogs with the same condition that do not take pimobendan. A large clinical trial in 2008 showed an increase in survival time in dogs with CHF secondary to MMVD when given a combination of pimobendan and furosemide, compared to dogs treated with benazepril and furosemide. Dogs with preclinical MMVD and no CHF typically do not benefit from being given pimobendan. Some studies have shown that dogs may experience a sudden worsening of their heart disease if they take pimobendan before the onset of CHF. Studies in cats with cardiomyopathies have shown little to no benefit after taking pimobendan, as well as in dogs with dilated cardiomyopathy (DCM). What are the side effects of pimobendan? Pimobendan has very few side effects. The most common is vomiting after giving the dose. At very high doses (such as accidental overdoses), pimobendan can cause fast heart rate, low blood pressure or high blood pressure. The “Feel Good” Effect Pimobendan can have a “non-cardiac effect” that is similar to one seen with caffeine – a slight stimulatory or “feel good” effect. While those that have studied pimobendan claim that it has no psychotropic effects, veterinarians and puppy parents have anecdotal evidence that their dogs have a better quality of life after starting pimobendan. Drug Interactions with pimobendan are unlikely. It is not recommended to give pimobendan with other phosphodiesterase inhibitors. How do I give my dog pimobendan? This is important!Pimobendan is given by mouth (orally) at least 1 hour prior to a meal. This is important! Food can reduce how well pimobendan is absorbed into the body. Contact us here for your pimobendan compounding needs. Our expert compounding pharmacists can compound pimobendan in a Flex-Dose Tab in several dosing strengths. We also compound pimobendan in capsules and flavored liquids ranging in strengths from 1mg to 20mg. Please contact us for additional information. 1. Mark Rishniw, BVSc, MS, ACVIM (Small Animal), ACVIM (Cardiology). Pimobendan FAQs. Veterinary Information Network. Last Update 21 July 2015. 2. Haggstrom J, Boswood A, O'Grady M, Jøns O, Smith S, Swift S, Borgarelli M, Gavaghan B, Kresken JG, Patteson M, Ablad B, Bussadori CM, Glaus T, Kovacevic A, Rapp M, Santilli RA, Tidholm A, Eriksson A, Bélanger MC, Deinert M, Little CJL, Kvart C, French AT, Rønn-Landbo M, Wess G, Eggertsdóttir AV, O'Sullivan ML, Schneider M, Lombard CW, Dukes-McEwan J, Willis R, Louvet A, Di Fruscia R. Effect of pimobendan or benazepril hydrochloride on survival times in dogs with congestive heart failure caused by naturally occurring myxomatous mitral valve disease: the QUEST study. J Vet Intern Med. 2008 Sep-Oct;22(5):1124–35. 3. Rush, J. Management of Congestive Heart Failure in Dogs. Southwest Veterinary Symposium Proceedings. 2016. Pimobendan is a drug used to treat heart failure by increasing the strength of the heart muscle contraction.